Recently, I read “The Truth About the Savolta Case” by celebrated Spanish writer Eduardo Mendoza. In his intriguing novel, Mendoza depicts the turbulent social milieu of early 20th century Barcelona, where there were daily clashes between workers demanding a raise and company owners exploiting workers. It was a critical time when Spain witnessed a massive influx of foreign ideologies such as Bolshevism and anarchism that instigated workers, and capitalism that captivated company owners. The novel, which was originally published as “Soldiers of Catalonia,” was immediately banned by the Franco administration, as it was believed to criticize the dictatorial regime, though indirectly. The novel unfolds the chaotic situation of Barcelona from 1917-20 when violence and hatred run rampant in the city as it experienced rapid modernization. Using the past mayhem, Mendoza tries to understand the present and foresee the future of Spain. In an interview, Mendoza said, “In my novels I attempt to relate the past with a vision that we hold of it today.” Indeed, reading the book, we come to realize that the past is a mirror that reflects the present and the future because many of the past incidents still resonate today and will continue to do so tomorrow. These descriptions fit surprisingly well with the contemporary social and political milieu of Korea where both progressives and conservatives are populists and “antagonizing and slandering each other until the nation falters and finally collapses.” It is embarrassing that today’s Korea can be compared with Spain in the early 20th century, and yet one cannot deny the astonishing similarities. The above descriptions, too, embarrassingly fit the Korean political climate these days, especially with the line, “climbing down an inverted Jacob’s ladder whose steps were revenge for revenge.” In order to reach Heaven, we should climb up the Jacob’s ladder, not climb down. However, we are constantly descending the ladder whose steps are vengeance for vengeance. Mendoza’s novel warns us that if we continue to return to the past and pursue political vendettas instead of ascending toward the future, we will consequently fall to hell. Toward those who are self-righteous, Mendoza also warns, “The irony of democracy is that it forces democracy to those who do not like it.” But that is against the true spirit of democracy that values and allows for diverse opinions. Of course, democracy is good. However, if we impose democracy on others simply because we believe it is good, we will ironically end up practicing the very tyranny that democracy detests so much. The “Polish Rider” by another famous Spanish novelist, Antonio Munoz Molina, is illuminating, too. This novel is the recollection of the protagonist Manuel on his family from 1870 to 1991. Manuel’s father represents the post-Civil War generation that was hopelessly victimized by the postwar poverty, grueling labor, and ruthless political repression of the Franco administration. On the other hand, Manuel represents the post-Franco generation that had to go through chaos and disorder during the process of democratization. It is well-known that amidst the chaotic environment after the death of Franco, the disillusioned Spanish people missed the economic prosperity and social stability of the Franco era. Just like Manuel and his father, we, too, have the two generations that had to go through major political turmoil in the Korean Peninsula. We have the father’s generation who experienced the military dictatorship and economic development, and the son’s generation, who is now frustrated and disillusioned by the chaos and disorder in the process of democratization. After the death of Franco, the Spanish people wisely chose reconciliation, not to reopen their past wound because they knew it surely would bring forth the evil cycle of everlasting political vendettas. As a result, today’s Spain has become a peaceful country where people live happily ever after. For a Korean reader, the pleasure of reading the novels of Mendoza and Molina primarily comes from the resemblance between Spain and Korea and the hindsight they provide. We should learn from Spain. 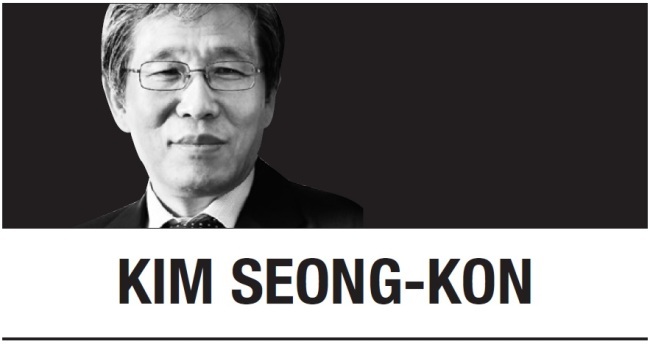 Kim Seong-kon is a professor emeritus of English at Seoul National University and a visiting professor at the University of California, Irvine. -- Ed.